Today I would like to give you a more detailed overview of the sewing book I wrote about last week, Little Miss Y.’s Homemade Wardrobe by Astrid-Fia De Craecker. It’s in Dutch, but the projects are so cute I thought it could interest some of you advanced enough not to need the instructions, and worse come to worst, eye candy for everyone! You can click on the pictures to see the details. 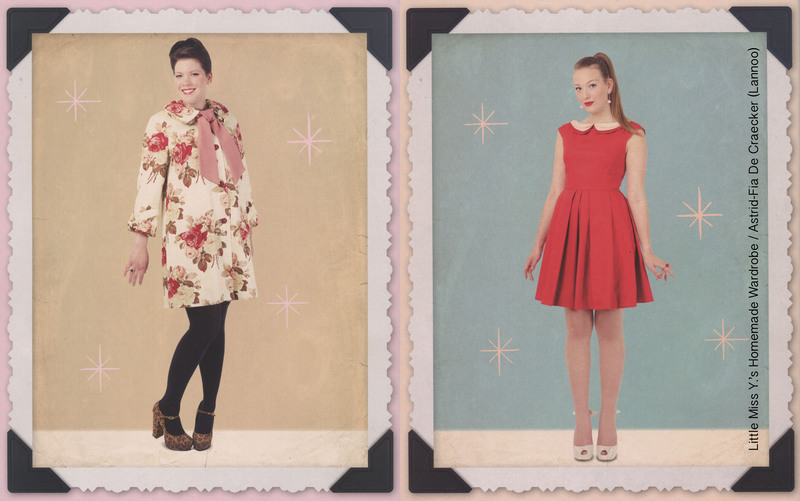 On the cover is a variation of the ‘December’ dress. 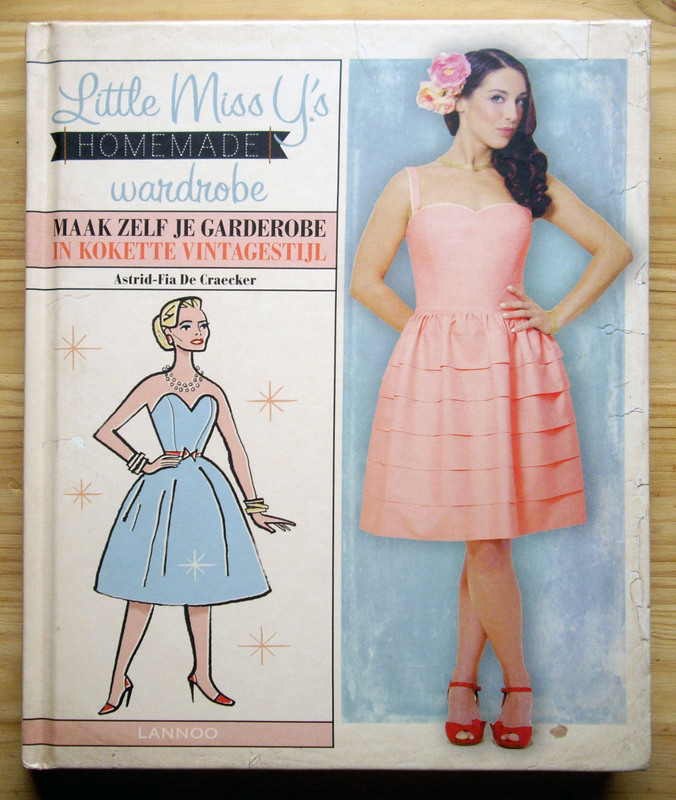 I found that book while browsing Belgian sewing online shop De Stoffenkamer late at night looking for things worth adding to my shopping basket while I was making another purchase. Seeing as there were only a picture of the cover and a small text of presentation and I couldn’t find a lot of information online (I think the book had just been released), I was really wary of buying a pig in a poke. But among the information I could find online was the fact that the author of the book had also written Homemade Mini Couture, a book that didn’t interest me because it was about sewing for kids, but that I had flipped through and thought it was a shame the focus wasn’t on sewing for women because a lot of the projects looked so damn cute. 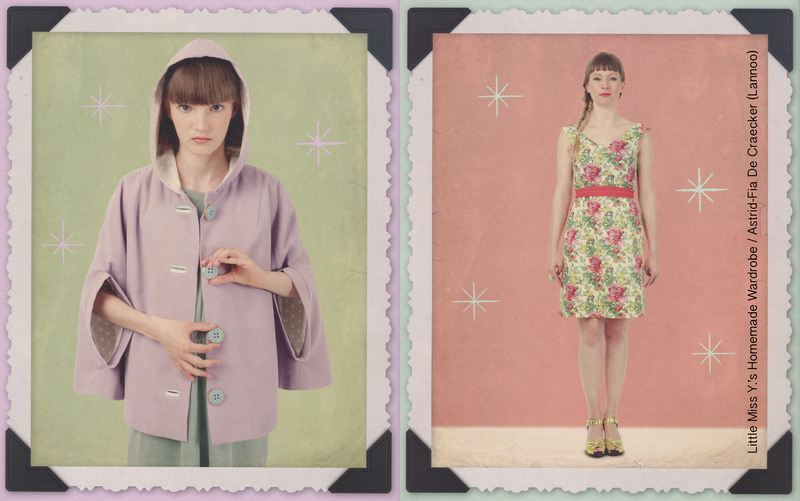 ‘Januari’ coat (you can tie a scarf through the hollow collar) and ‘Februari’ dress (the dress I made). So I took the risk and added it to my order (that’s what shopping at night does to you). And I’m most definitely glad I did! If only for the dress I already sewed and its three (THREE!!!) peter pan collars, it was love at first sight. The retro layout is beautiful and there’s not one project in the book that I don’t like. I don’t see myself sewing all of them of course (or do I? ), but there are at least seven I’d like to make (I know it’s not realistic knowing how slow I sew and how many other projects I have in mind, but I’m talking about my dreams, not down to earth reality)! ‘Maart’ cape and ‘April’ wrap dress. I’m showing you all of the projects here because had I been able to see them before buying the book, I would not have hesitated for one second whether to buy it. I’m not sure I have the right to do so and I hope it’s ok as long as I mention the source: it’s not like I want to pretend they’re mine or anything… What do you think? There are other pictures in the book, either of details or of variations, but I chose only to include the introductory picture for each of the projects. ‘Mei’ blouse (not shown here, but the back has a cute cut out!) and ‘Juni’ shirtdress. Anyway, back to the book: in theory there are twelve (cuuuute) sewing projects, one for each month of the year, but there are even more if you count the fact that there are two garments (shorts and a halter top) for July and more suggested variations for most of the patterns. Each pattern goes from size 30(!) to size 44. Just so you know, I made my dress in a size 36, which would be my Burda or Deer&Doe size for such a dress, and it fit perfectly. You can also find the usual basic sewing techniques at the beginning of the book: those instructions as well as the instructions for each project are illustrated by Maarten Vande Wiele, who made all of the artwork in the book. I read the instructions for the dress I made, and I found them quite clear and complete, with details that add a nice touch such as grading and understitching the collar seam. 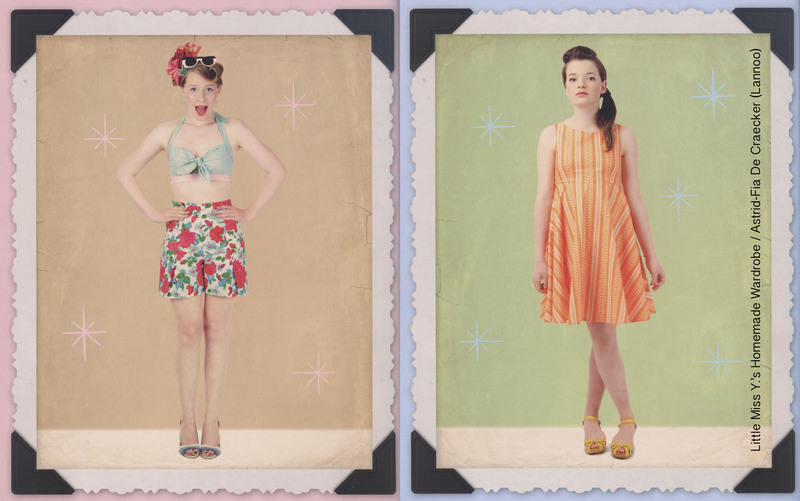 ‘Juli’ short and halter top and ‘Augustus’ high waist dress. Now for the things I didn’t quite like about the book. I already mentioned the first one in my dress post, which is the fact that I found the pattern a bit difficult to trace. Each pattern uses a different colour and the pattern sheets don’t seem that full since there are only two to four patterns on each of them, but some lines of one pattern were on top of a line of another one and it was also difficult at times to follow the curved line of the size I chose among the other sizes (though I must confess that I traced the pattern late at night, which meant terrible lighting and not the brightest state of mind). Also, there’s no worded indication such as “fold line” or other things like that, only signs, which you’ll make sense out of if this isn’t you first time working with a sewing pattern, but which I couldn’t find a legend for in case I needed one. What I also couldn’t find was whether the seam allowances are included or not in the patterns. Judging from the form of the collars of the dress I chose, I concluded that they are not included (and everything worked up fine, so I guess I was right). ETA: I was right, but I don’t know how I managed not to see that it’s in fact written perfectly clearly under the pattern pieces diagram of each project! It says that you need to add 1,5 cm seam allowances unless specified otherwise. 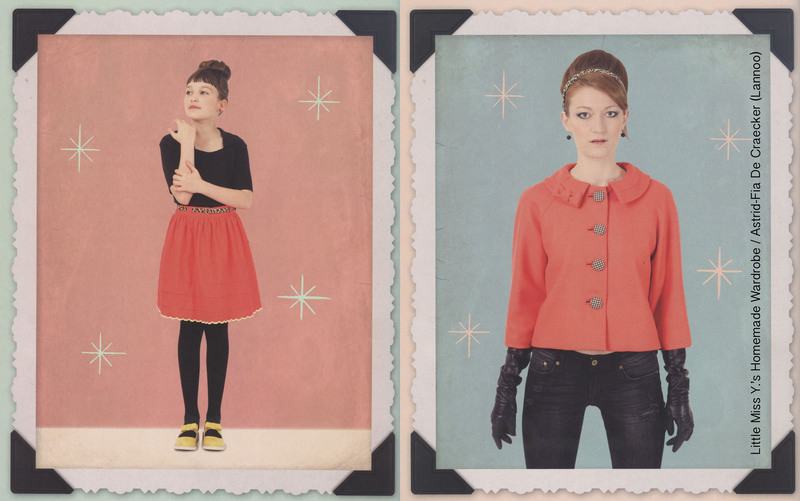 ‘September’ skirt and ‘Oktober’ short jacket (there’s a bow on the collar!). My last criticism concerns the size indications: you can find a size table for each pattern at the end of the book, indicating some of its finished measurements (but not all of them! ), but no general bust-waist-hip measurements of the body it is supposed to fit. As an example, for the dress I made, for the size 36 you’ll know the underarm measurement of the dress is 86 cm and its total length is 90 cm… and that’s it! I personally went and measured the pattern pieces to get a better idea of which size I had to choose. 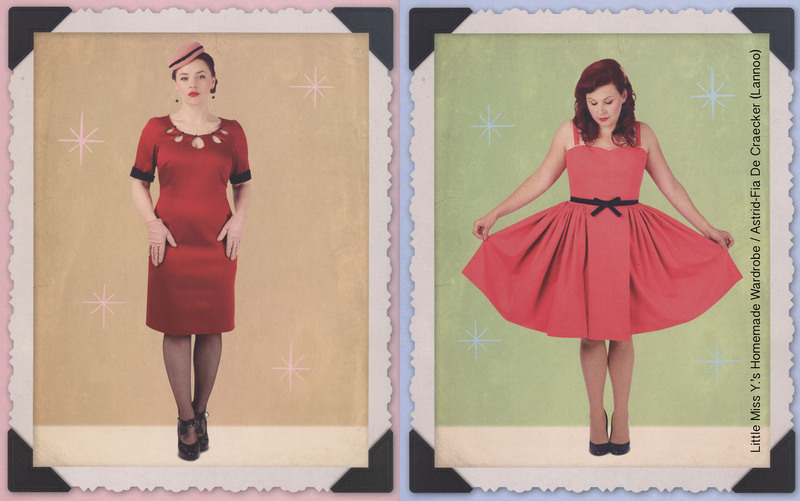 ‘November’ (red) little black dress and ‘December’ bustier dress. Oh Dear, I really hope not to have put anyone off buying the book with my nit-picking! Despite my criticism, I still think it’s a great book that is totally worth buying! And I actually wonder whether the things I found missing weren’t a simple oversight instead of a deliberate choice. But I wanted to write a honest review, one that would have anyone who reads it make an informed choice about buying it or not. 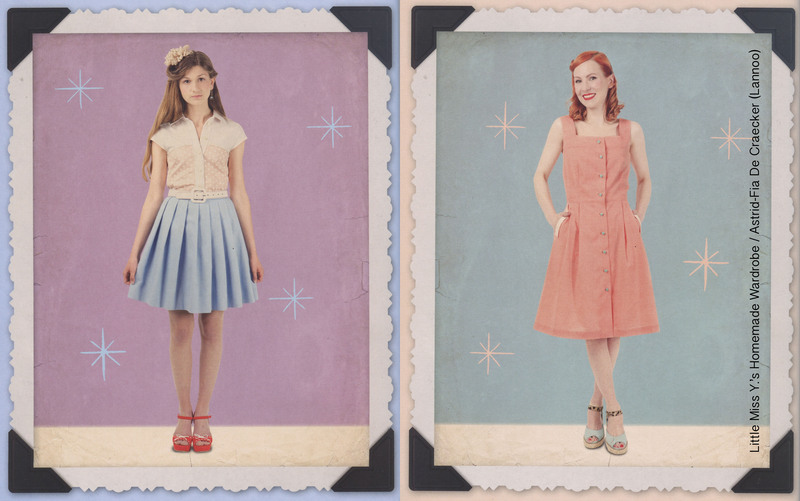 I would definitely recommend buying Little Miss Y.’s Homemade Wardrobe if you like vintage style sewing, because the projects are cute as can be and not difficult at all to sew once you figure out which size to pick! I already sewed what is close to the dress of my dreams with its three peter pan collars, and I have a feeling it won’t be too long before I either revisit the same pattern or try another one.